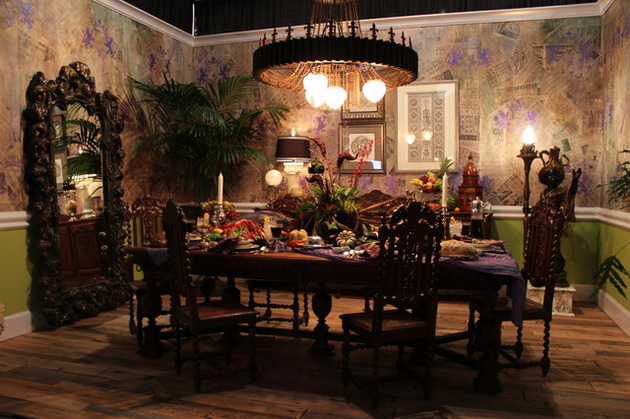 Treat your dining room like the set of a stage, where your only boundary is your own imagination. Here are 20 delicious dining room designs that dish out the drama. 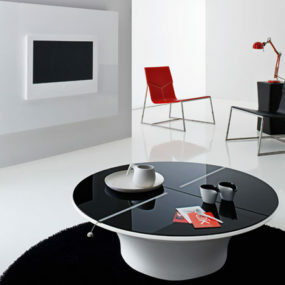 But these elaborate tabletops were created for a worthy cause. Showcased in 2012 at the Portland Fall Home & Garden Show as part of Serving Up Style: Designers Fighting Lupus, Portland-area interior designers were called to the table (pun intended) to bring their best with all proceeds benefitting lupus awareness. Whether you’re supporting the cause or looking for a little inspiration, these dining rooms will have you coming back for seconds. 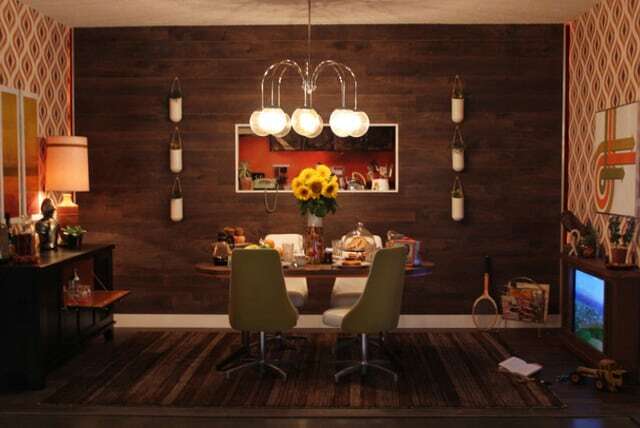 This 1970s inspired dining room Jason Ball Interiors, aptly dubbed “Yesterday Once More,” features the color combo of orange and brown, wood walls, and a retro dining set in a retro shade of avocado. In spite of its classic elements, the space has a modern edge with a cool chandelier and white planters mounted to the wall. Check out the TV – this little blast from the past adds authenticity and kitsch appeal. 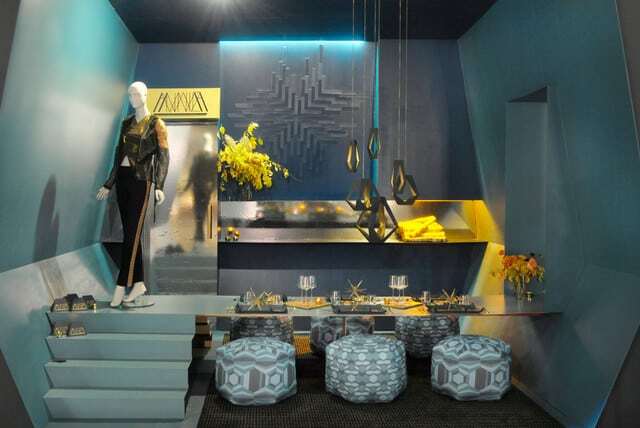 This design by Stephanie Dyer Interiors takes a while to decipher, but what we’ve got here is a complex blend of shape and pattern, done in a trendy palette of greys with pops of yellow. The ottoman poufs are as interesting to look at as they are to sit on, encircling a platform dining table that connects with the raised floor. Suspended from the ceiling, the staggered cluster of pendant lights makes a modern focal point. 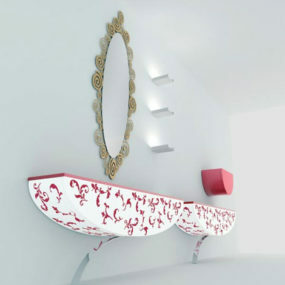 The angled walls add interest and intimacy to the otherwise cool design. 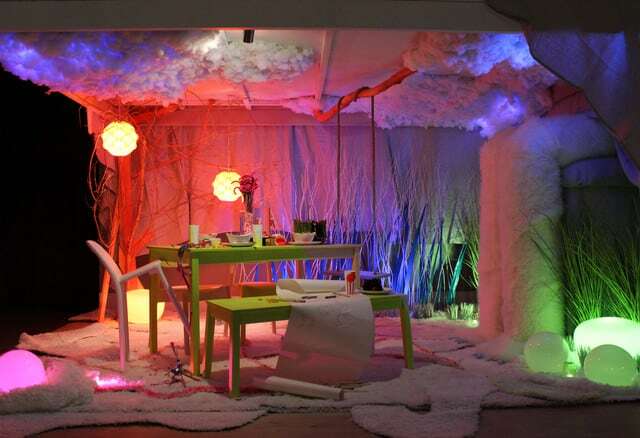 This artfully illuminated dining area will whet your appetite for whimsy. 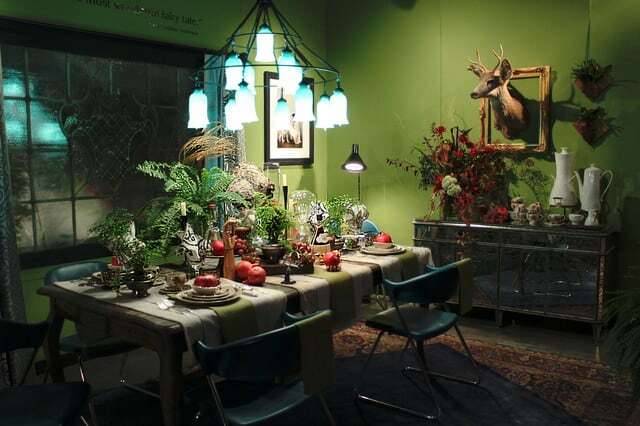 Designed by Art Institute of Portland and IKEA Portland, the space – aptly dubbed “Appetite for Wonder” – is awash in glowing pinks, blues and greens. Colorful furniture is complemented by fantastical elements like “clouds” overhead, tufts of grass and twiggy branches, bringing a bit of the “enchanted forest” indoors. 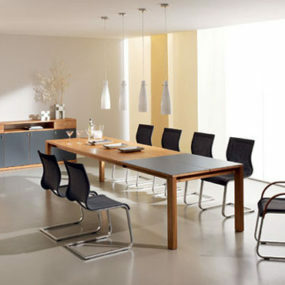 We love the sophistication of this dining room, but that’s not to say it’s subtle of simple. 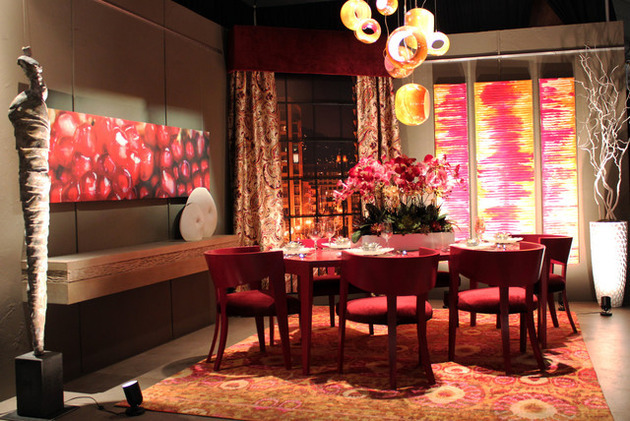 The room, by Pangaea interior Design features vibrant artwork and a color palette that melts into the rich red dining chairs, window treatments and the floral patterned rug underfoot. The pendant lights hang deliciously overhead, like ripe fruit dangling just within reach. This green dining room by Looptworks is a breath of fresh air. The design’s outdoor aesthetic is complemented by its eco conscious agenda, made using “upcycled,” reclaimed and salvaged materials. Love the chandelier, with its trail of blooms and hues. 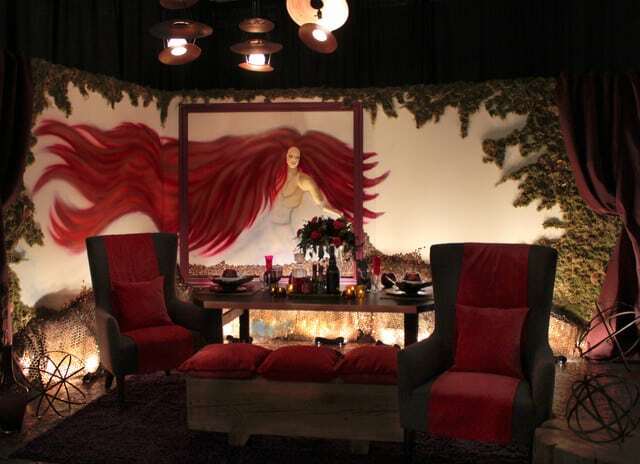 If it’s drama you seek, check out this dining room by Jonquil-Design. 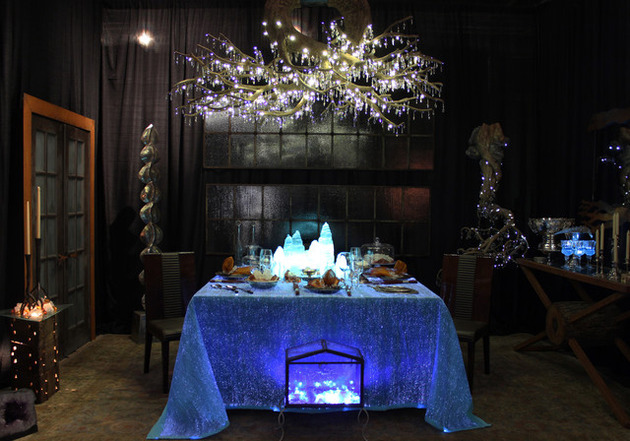 The shimmering chandelier overhead is inspired by tree branches, shimmering with tiny icicles in the moonlight. The black drapery gives the space some essential intimate, upping the romance factor, while drawing attention to the interesting lighting elements – the true showpiece here. The merry-go-round theme is not lost in this playful kitchen, inspired by this fair favorite. The aptly named Merry Marry kitchen by Wendy O’Brien Interior Design reminds us of an antique sepia photograph, awash in muted browns and beiges, with a small “window” opening behind the table framing pops of vibrant color in the painted scene. The Portland skyline (well, a mural of it, anyway) overlooks this rustic-meets-urban style dining area by The Room Stylers. The space itself is an ode to the city, capturing its charms and commitment to eco friendly living through the use of repurposed pallet boards and reclaimed decking. The large-scale vintage style mirror and city reflect Portland’s nightlife. It’s easy to see that the designer of this dining room, Digs Inside and Out, is a firm specializing in both indoor and outdoor decorating. 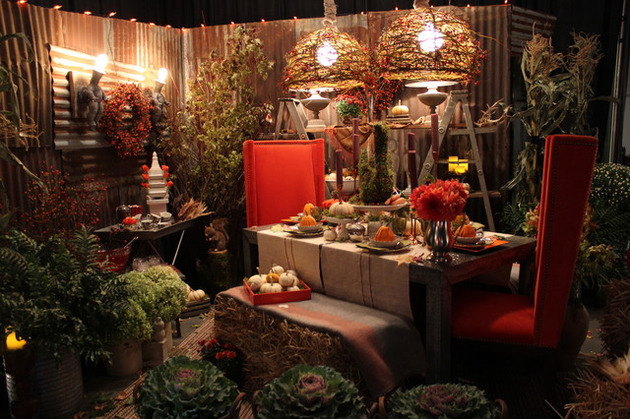 The space is filled with lush plants, fruit and flowers, coloring the room in warm, autumn harvest hues. 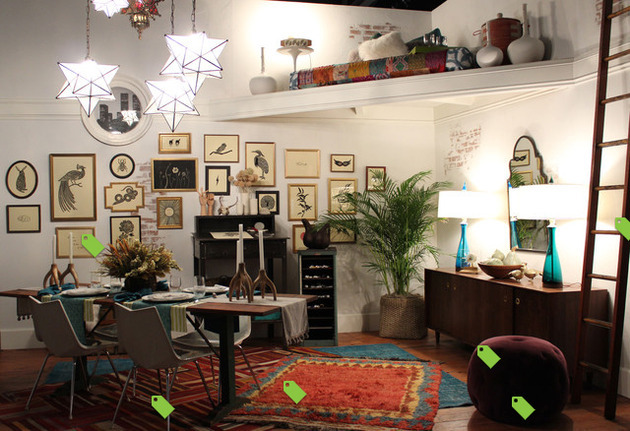 Leafy accents and branch wrapped pendant lights are organic adornments not only inspired by nature, but made from it. A pair of high-backed, orange velvet dining chairs invite you to sit and feast. This dining room by Terrance Mason Interiors has an extravagant air about it, and a grandiose title to match – Lost & Crowned. 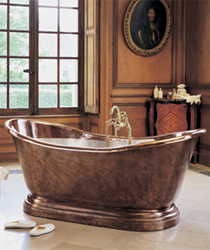 The designer was inspired by the concept of antique objects and the stories behind them. Walls are treated with old newspapers and splashes of regal purple. The gothic-style dining table and chairs feature intricate carving, and it’s all topped off with a custom-made wooden cog chandelier – the crowning glory of the space. 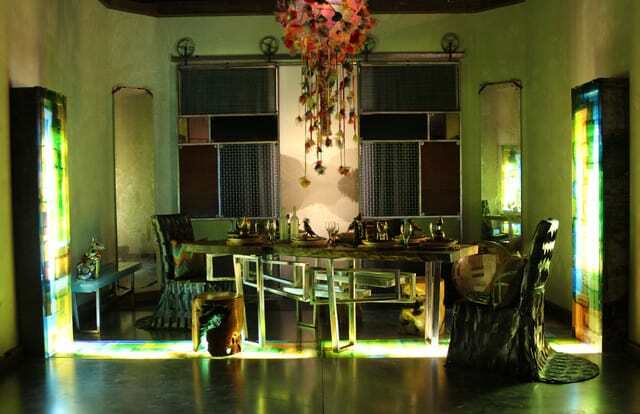 This worldly dining area by Ida York Interior Design has some unexpected, though welcome, elements. 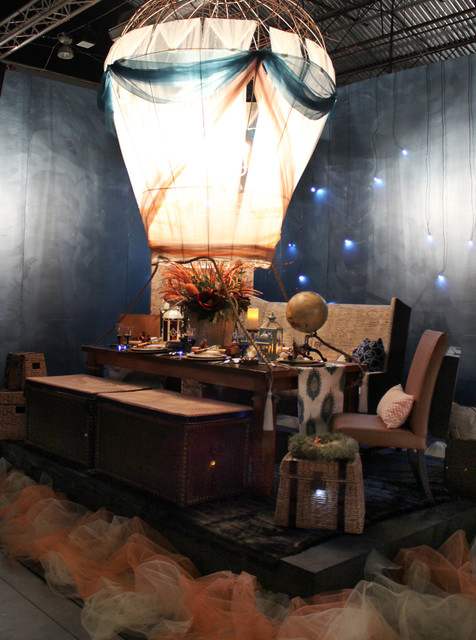 A mix of patterns, textures and materials gives it a “collected” look, perfectly suited to its title, “Where to next?” At the heart of this dining room design, a hot air balloon illuminated the tabletop while lending it an intriguing theme and centerpiece. 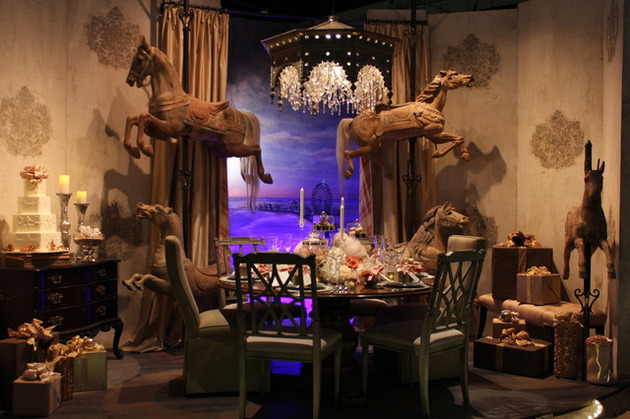 Designed by Interiors by Blackwood, this dreamy dining room really takes the romance of fairytales to the next level. 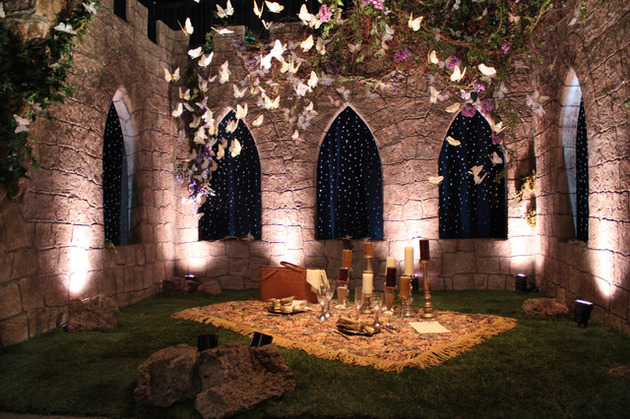 Inspired by a favorite childhood book the designer had growing up, this dining room design features magical castle walls, an enchanting swirl of butterflies overhead, and a grassy floor underfoot set with a romantic picnic for two. Bathed in the signature Tiffany & Co shade of blue, it’s only fitting that this dining room by Urban I.D. Interior Design is adorned in shimmering mirrors and crystal galore, and ultra feminine chandelier overhead, and a portrait of Audrey Hepburn herself displayed on the wall. 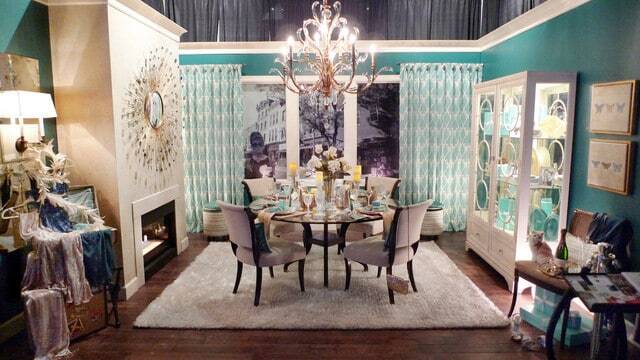 Though the space is called “Dinner at Tiffany’s” we think it would make a fabulous setting for any meal – breakfast, lunch or dinner! Take a walk on the wild side in “Jane + Tarzan’s Hollywood Retreat,” designed by Modurne Fine Furnishings and Funktional Interiors. 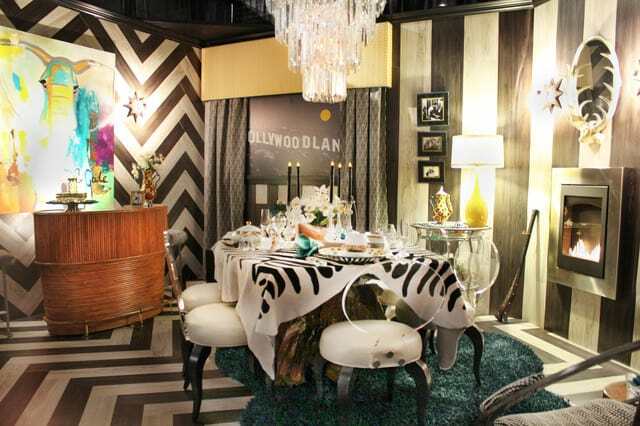 It all began with a leopard and zebra print tea set, inspiring this amazing dining room with a black-and-white chevron print floor and wall – a sophisticated interpretation of the zebra’s stripes. Surrounding the dining table the chairs are to inspired by the long, lean legs of this exotic equine. Adding a touch of Hollywood, the graphic “Hollywoodland” wallpaper is complemented by the luxurious crystal chandelier dangling overhead. With a motto that reads, “Everything old is new again” on their website, Abode Design brought that 1960s “Mad Men” aesthetic to life in small but potent doses in this eclectic dining room, where brick wall prints, collections on display, staggered lanterns suspended from the ceiling, and overlapping rugs underfoot all add authenticity and flavor to the dinner table. 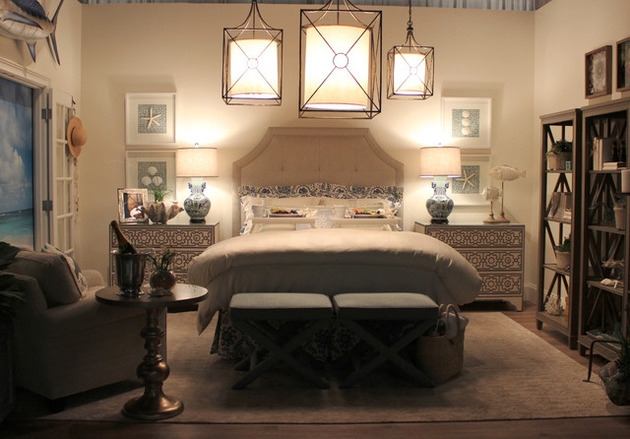 Diane Keaton Interiors is blurring the boundary between dinner time and bed time. While not your conventional dining room, this space delivers the simple luxury of breakfast in bed. And why not try dinner in bed too? Offering the ultimate in cozy comfort, you can put your feet up and relax. The beach theme is always in the background – from suggestive elements like and the weathered wood furniture and the straw hat hanging on the door, to the more obvious mounted fish, framed seashells and sand toned background. 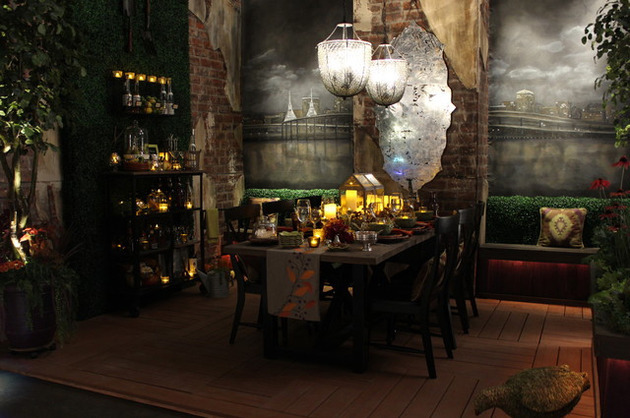 Garrison Hullinger Interior Design Inc. brought some interesting characters to this dinner party. 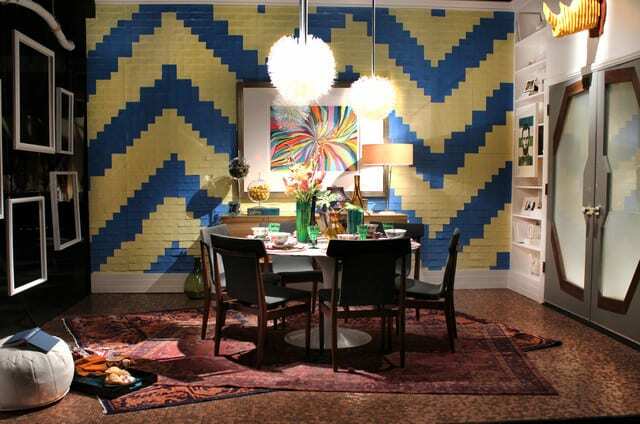 The bold chevron wall is fashioned of blue and yellow sticky notes, a pair of recycled bottle pendant lights, and a Lego rhino head proudly mounted overlooking it all. 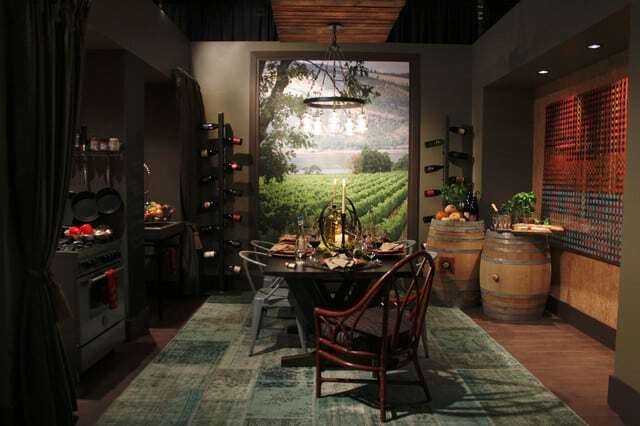 This rustic dining room is something from the Italian countryside, complete with wine barrels and scenery! The design by Myers & Associates, features a dining area / wine cellar, with the kitchen appliances tucked into a nook off the main room, hidden behind a heavy curtain when not in use. Co Co Designs took a daring approach to this dining room, which teeters somewhere between artwork and eating area. Outfitted with luxurious armchairs and pillow-topped bench in a deep red hue, this room design not only serves up decadent dishes, but a rich look and feel too. A little piece of Mexico’s Museo Soumayo surrounds the space, inspiring the penny-tiled half wall.